The renovation of a 50-year-old former church into a center for homeless families features a healing twist. Bright red is the color of hunger; primary blue is the color of thirst. However, pastel blues and greens are colors that can create a calming environment able to ease the effects of trauma. 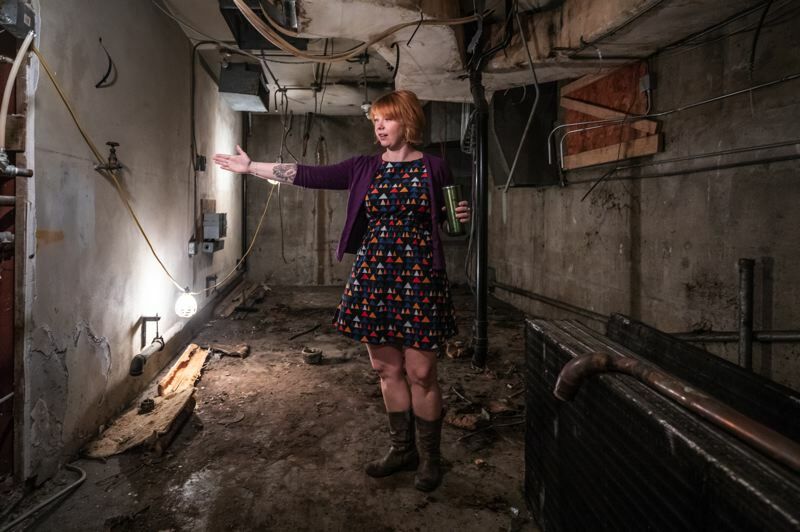 That's the design concept that being used to renovate a Portland building into a place where homeless families can find shelter and assistance as they move toward permanent housing and economic stability. The center is an effort by local nonprofit Portland Homeless Family Solutions to create what executive director Brandi Tuck calls a one-stop shop that eventually will offer homeless families a place to stay around the clock along with access to life skill classes, health care and mental health services. 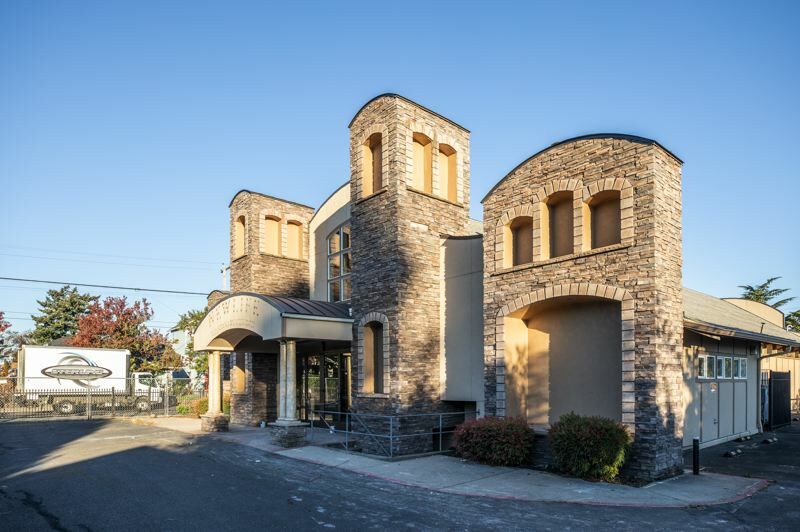 But the center will need to serve another purpose — to provide a setting where families can start to heal from the mental and emotional impacts that result from being homeless. That's where Tuck thinks a concept she calls trauma-informed design can make a difference. Interior and landscape design aspects — from mild color palettes to therapy gardens — have been used for years in hospitals to help reduce depression in patients and reduce the time it takes them to heal. More recently, professionals in the building industry have started to study how design can be used to help military veterans suffering from post-traumatic stress disorder. But as far as Tuck knows, her organization's effort to use design to help ease trauma for people living in homeless shelters is largely untested ground. She's hoping that what her group learns from the approach at the center will benefit more families than just the ones that stay there. "We think (our project) may open new paths for research and educational opportunities," Tuck said. Portland Homeless Families Solutions began in 1994 when a group of people noticed homeless families in downtown Portland and decided to start a shelter during the winter months. Tuck joined the shelter as a volunteer in 2005. Two years later, she was hired as a part-time executive director, managing a staff of three part-time employees and an overnight shelter program able to help eight homeless families at time. In 2009, as a nonprofit, PHFS opened day-shelter services and three years later added life-skills classes and case management services. These days, Tuck's organization runs four programs, including one that helps working families cover rent and utilities when faced with unexpected or emergency situations. But the group's main focus is still on families that are on the streets, and the shelter program has become a year-round effort. It's a service that's needed more than ever, Tuck said. Although Portland Homeless Family Services offers families places to sleep at night and keep their belongings during the day, the arrangement is far from convenient. Overnight services are located in a church, an arrangement that features cots in sleeping areas separated by partitions on casters. Because the space is used for other purposes during the day, the room must be cleared out by 7 a.m. Families have to pack up their belongings and take them with them when they head to the space that Tuck's group offers during daytime hours. When night comes, the cycle begins again. About 10 years ago, Tuck's group decided to begin working on a long-term plan to build a family housing center that would eliminate the need for families to move back and forth between day and night locations. The group already was spending about $120,000 annually on rent for the spaces it used and decided it would make more sense to buy a building for the center. 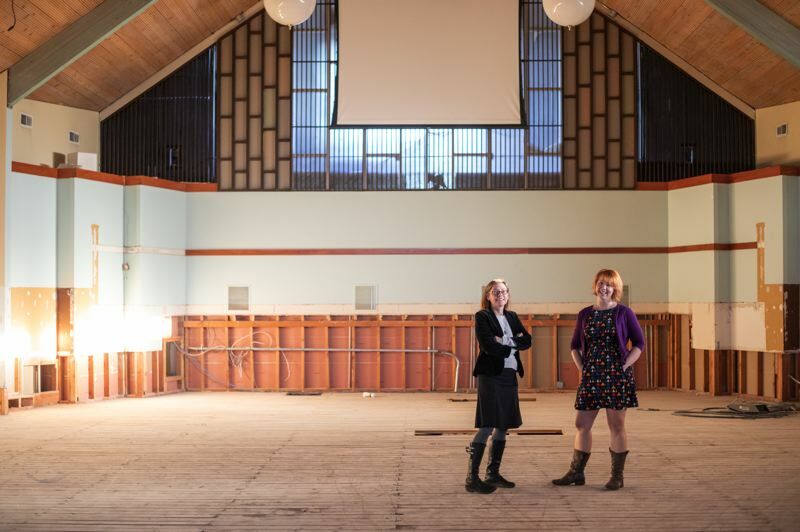 Last year, the group came across a 55-year-old former church building on Southeast 92nd Avenue in the Lents area that was for sale. PHFS raised $2 million in donations and with a $1.3 million mortgage added, became owner of the property. Tigard-based Clear Water Construction Services signed on to serve as general contractor for whatever work would need to be done to the structure. Then Tuck went to work looking for local firms willing to provide input on the best way to renovate the space for her organization's needs. As they walked through the former church, though, Tuck explained how PHFS uses an approach called trauma-informed care to help families. The approach, which has become increasing popular among people who run shelters, focuses on providing services in a way that builds dignity for families experiencing homelessness while also restoring a sense of power for them and promoting autonomy. When people undergo a trauma like homelessness, chemicals released in the brain send people into one of three behaviors: fight, flight or freeze. How a person reacts depends on a number of individual factors, but Tuck has seen all three behaviors exhibited by the people who stay in her organization's shelter services, including children. Trauma-informed care calms the brain down and brings cognitive functions back on line. Helgerson and two of her employees, Heather Menegat and Andra Padilla, decided to provide some pro bono services for the project and began to dig into ways the tenets of trauma-informed care could be applied to designs for the center. The interior designers knew color can have a strong impact on people's behavior. Hot, bright colors, for example, are often used in restaurants because they can enhance a person's hunger. For trauma-informed design for the center, they turned to a more soothing palette, tapping into ocean-related pastels: watery blues, aquas, grays, beiges and soft whites. The color palette also will provide a secondary benefit. The basement space, which previously served as classrooms for the church, will be converted into a series of small bedrooms for up to 10 families. "Some of the spaces are small, constricted rooms. We wanted those spaces to be as light and airy as possible," Menegat said. Another aspect of creating a calming environment is the use of natural wood. 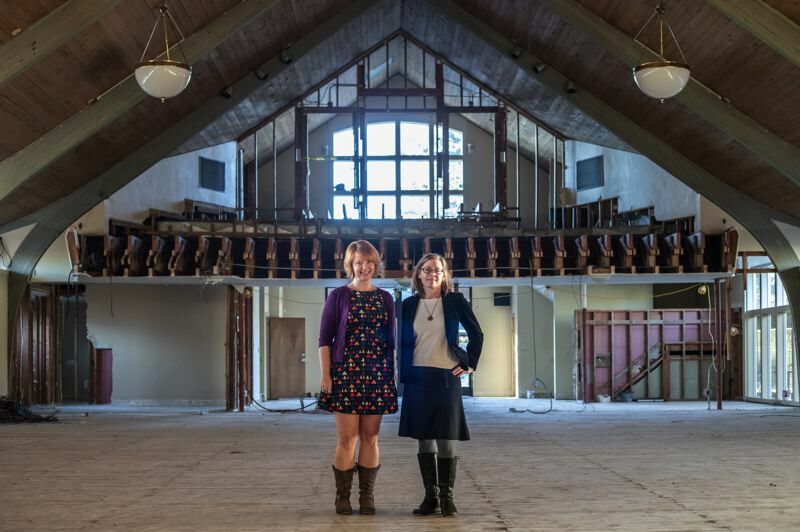 The former sanctuary space of the main floor will become a community living space. The area where the church congregation sat will be turned into a series of living-room spaces where families can go to have some privacy. "We're really making the most of (the room's trusses)," said Andrea Matthews, a project architect with Carleton Hart Architecture, which is volunteering time to make sure the project adheres to city codes. Trauma-informed design for the center even extends to furniture choices. Using round tables rather than rectangular tables in the dining room, for example, puts everyone on the same level by eliminating the feeling that one person is sitting in a power position at the head of table, Menegat said. The concept of trauma-informed design isn't being limited to the interior of the center building. 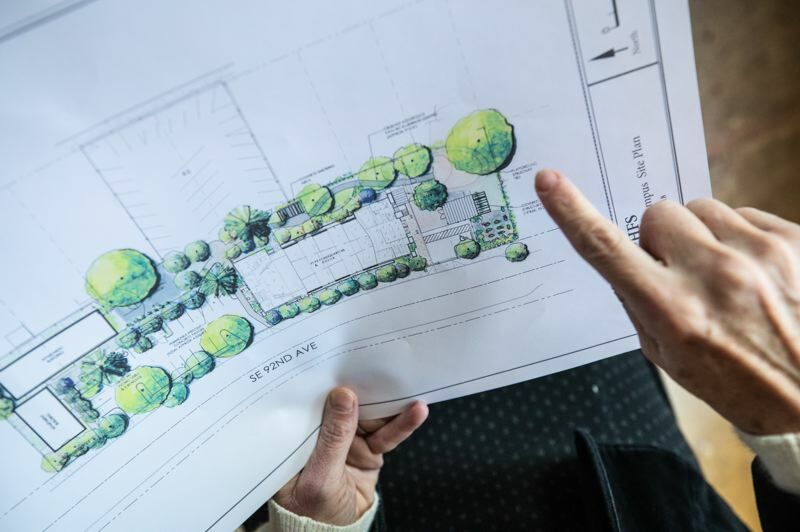 Cathy Corlett, who is providing pro bono landscape architecture services, has worked with Curtis Riley of Maul Foster Alongi and Naomi Miller, a lighting designer with the Pacific Northwest Natural Laboratory, to figure out how the concept can be used outside the building as well. Outdoor lighting is necessary to provide a sense of security for the center's residents. But Miller has recommended sources with warmer light than the usual harsh white lights used for institutional buildings at night. The center's grounds also will feature a garden where families at the center will be encouraged to help plant vegetables and edible flowers, and Corlett's suggested landscape inventory includes plants and trees that do more than provide visual components. The fallen leaves of the Katsura tree, for example, give off a smell like burnt sugar. "We're trying to bring our beautiful — and healing — indoor spaces to the outdoors," Tuck said.